Bizagi offers its functionality so that it can be invoked directly from external applications through a service-oriented API. The service-oriented API features SOAP-compliant Web services, which do not require starting configuration for their use. For more information about Bizagi's built-in Web services, refer to Bizagi API for external applications. Bizagi Web services support WS-Security capabilities, and comply to the most widely used WS-* standards. For production environments, it is recommended and especially useful to make sure that you enable WS-Security for such Bizagi Web services. This will allow you to enforce that Bizagi Web services are strictly invoked only by an authorized application (providing adequate user name and password), and to be able to rely on the use of certificates (X.509 compliant) for SOAP messages encryption. 1. To install Microsoft .NET Framework in its 4.5 version. 2. To have official X.509 certificates (as issued by an appropriate CA) for encryption purposes. Such certificates should be valid and already installed. Note that your platform administrator will require adequate expertise on this subject (certificates, their use and installation). Once you have this framework's version installed, you will need to enable the Web services security as a feature in your Bizagi project as described below. By default, Bizagi legacy web services do not include features complying to WS-* standards and security. Bizagi projects which are upgraded from versions 10 to 11 will keep using Legacy web services, which are the ones that do not present the security features. On the other hand, those Bizagi projects created in version 11 will start by using the security feature enabled. Legacy web services rely on asmx services, as featured by older versions of the .NET framework (i.e, v2.0), while Web services using WS-Security rely on the Windows communication foundation framework (WCF). 1. 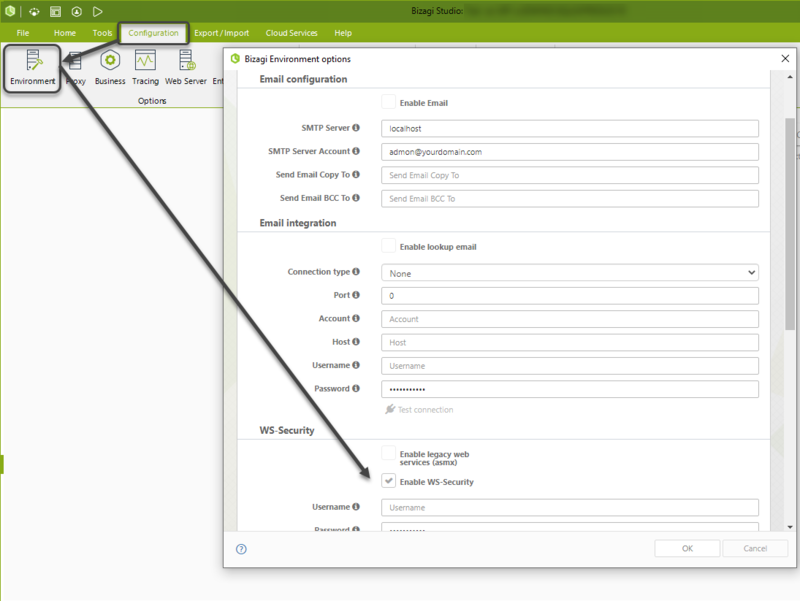 Enable WS-Security and disable Legacy web services. In case your project was upgraded from a previous release, and you were using the Legacy web services, you will need to first make sure you adequate any external applications to invoke the new Web services. 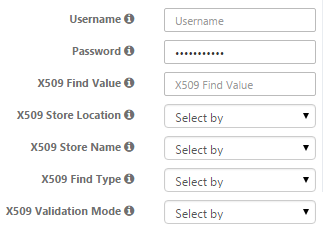 When enabling WS-Security, make sure you configure all parameters according to your installed X.509 certificates. 2. Configure additional security aspects for such web services at the application server. Furthermore, this recommendation applies regardless of the Bizagi Web services you employ, and it means configuring IP white lists, additional protection for the resources in your application server, as described at Security setup. 1. Open the Environment Options from the main ribbon and select the Popular tab. Tick the Enable WS-security checkbox (and leave unmarked the Enable legacy web services checkbox). In case you do need backwards compatibility or the use of Legacy web services (not the preferred option), at anytime you may switch back to using those. 2. Fill out the parameters for the WS-Security feature. Note that in order to enable encryption and signing capabilities, you will need to specify the usual information regarding installed x509 certificates (such as the store name and location). Enter configuration details as detailed below (you must necessarily use all of the security aspects of this feature which include authentication, signing and encryption). The user name token used for signing. For authentication purposes of the web services, you must define a user name token (as specified by the WS-Security standard). Define a password for the above user name token. The common name of the installed X.509 certificate. The location of the store where the X.509 certificate is installed. 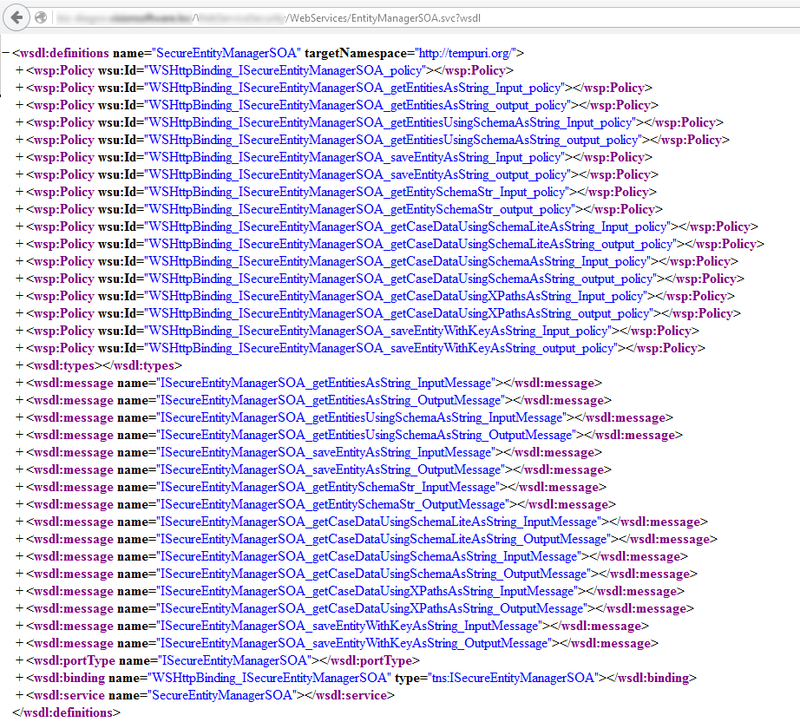 You may use the MMC snap-in to verify such information (https://msdn.microsoft.com/en-us/library/ms788967(v=vs.110).aspx). The name of the store where the X.509 certificate is installed. The value which filters how to use the Find Value parameter. For the common name, use FindBySubjectName. •ChainTrust: This one validates the certificate using the certification authority. In .NET scenarios, it may be more reliable to use this option. •PeerTrust: This one is validated by the server by checking its trusted store (recommended). PeerTrust implies that the incoming certificate has to be in the Trusted People certificate folder. •PeerOrChainTrust: Any of the previous one. •None: Trust any certificate (not recommended). 3. Make sure your external applications or programs invoke such services by providing user name and password. Similarly, recall that these should be able to rely on the installed certificates for encryption and signing capabilities. The URL of Web services using the security feature (WS-Security) will use an .svc termination instead. Additional external links may present tutorials and guides oriented for first-time certificate users, such as http://www.reliablesoftware.com/DasBlog/PermaLink,guid,6507b2c6-473e-4ddc-9e66-8a161e5df6e9.aspx. Further information on WS-* standards can be found at https://www.oasis-open.org/committees/tc_home.php?wg_abbrev=wss (as published and maintained by OASIS WSS.